Finally, LinkedIn presented it’s newest feature, the complete integration with Twitter. When I say complete I mean status updates go both way. I personally didn’t expect something as good and as useful from LinkedIn any time soon. Post Tweets using the LinkedIn status (by checking the check-box next to the Twitter logo). If you go to the Twitter Settings (drop down menu on the Twitter logo at homepage) you will see you can actually add more Twitter accounts to your LinkedIn profile. And wow, here comes the magic part: when you add more then one Twitter account to your LinkedIn profile, you’re converting LinkedIn into a powerful Twitter multy-account management client. What a perfect tool for business people handling several corporate accounts and their personal account. Now when I post status update via LinkedIn, I can choose on which account (or accounts) I wish my Tweet to appear using the good old drop-down on the Twitter logo. Long live LinkedIn! 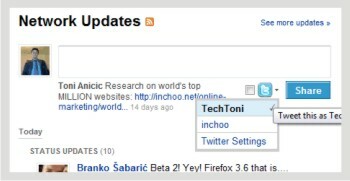 Don’t forget to follow Inchoo via Twitter!